Faryl Atheron is a Dunmer farmer who lives with his brother Aval and his sister Suvaris at the Atheron Residence in the Gray Quarter of Windhelm. 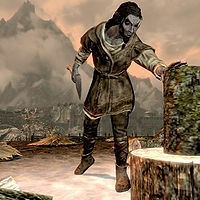 Faryl wears a belted tunic and a pair of boots, and carries around the key to his family house along with a selection of common loot and gold. 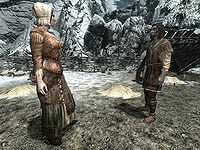 Faryl spends every evening between 8pm and 2am wandering the streets of Windhelm, so he is usually there at the Gray Quarter during the night for Rolff Stone-Fist's loud insults. From 2am till 8am he sleeps at his house. During the day, Morndas through Fredas, Faryl can be found at the steps of New Gnisis Cornerclub where his brother Aval joins him with a drink around 7pm. Faryl works as a farmer at Brandy-Mug Farm on Loredas and Sundas from 8am until 8pm. He is not very enthusiastic about hard farm work, although he appreciates the money Bolfrida pays him and also the fact that nobody from Windhelm can see him working here. He will remark to you that, "Bolfrida is certainly grating, but she pays well. Thankfully nobody from the city can see me out here." He does not share the hatred towards the Nords as many other Dunmer do and he will tell you that, "Farm work is hard work. It's good to relax when I can, but I still have to listen to my brothers harping about 'injustices.'" Although he does like some aspects of his job, Faryl will explain to you that it's not the first job he would have wanted to take: "Of course working for Bolfrida isn't my first choice. But what else can a Dunmer do out here?" He will also tell you about his brother's dislike of how he and his sister work for Nords: "My sister and I both work for the Nords. Our brother is ashamed of us, but at least we can affort [sic] to eat." Faryl: "I don't think we're going to get those potatoes to come in." Bolfrida: "Well of course, not with an attitude like that!" Faryl: "The ground is practically frozen. We can't dig down far enough." Bolfrida: "Come on, we just need a little elbow grease." Bolfrida: "I'll bet this is better than trying to grow something in Morrowind, though, isn't it?" Faryl: "Firstly, I've never even seen Morrowind. Secondly, in volcanic soil the plants practically grow themselves." Bolfrida: "Oh, my, I hadn't thought of that." Faryl: "There are places in the world that aren't wrapped in ice, you know." Bolfrida: "Now, I've been reading about the best ways to grow corn in permafrost..."
Faryl: "I keep telling you, without a warming enchantment, it will never grow past your ankles." Bolfrida: "Right, but if you plow the soil with fire salts..."
Faryl: "Then you've salted it and nothing will grow at all. Genius." Bolfrida: "Oh dear, I hadn't thought of that." This page was last modified on 23 August 2018, at 02:47.